If you’re reading this, we’re pretty sure you’re most interested in learning about UIW’s 3D Animation & Game Design B.F.A. program. 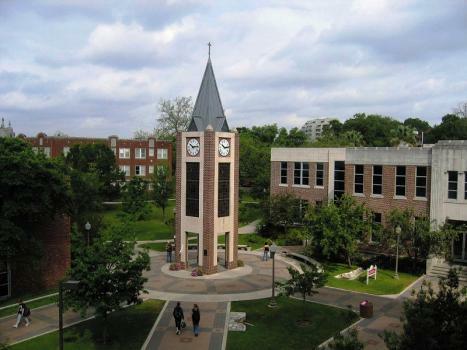 Whether you're curious about the solid career-prep curriculum that UIW offers, or how it uniquely welcomes transfer students directly into the program, there are no shortage of unique attributes worth checking out. To get more insight, we go straight to the source and speak to Assistant Professor Matt Tovar for our latest Q&A. Enjoy! ACR: Matt, let’s start with you. You are a UIW graduate who went on to a industry career in California. What attracted you to return to UIW and teach 3D Animation & Game Design? Matt Tover: The small class sizes are actually one of the most attractive things about teaching at UIW. I’m able to give one-on-one critiques and sit down with each student to answer questions and give pointers. The class has a small studio environment feel where we all give and accept feedback in the process of learning and becoming better artists. Another attractive thing is that UIW is very open to me continuing my own animation career whether by freelance work or by jumping back into a studio over the summer break. ACR: UIW’s 3D Animation & Game Design is rigorous and demanding, culminating in a BFA. Give us a ‘day-in-the-life’ of an undergrad. MT: Most students take a full load of classes; 12 hours in class with half of those being courses within the 3D major. We give a good amount of homework in each of our 3D courses as we understand that the industry is very competitive so we really push our students. That said, the students have access to our labs 24/7 so much of the times they’ll be in the labs working with each other on assignments or side projects. We always encourage students to do non-assignment type work outside of class as it will help them grow as artists. ACR: What skillsets are imperative for your students to gain at UIW if they intend to break into the industry? MT: The industry is in fact extremely competitive. As far as animation goes, one of the skills students need is a high understanding of proper biomechanics. The bar keeps on raising and studios can tell right away whether someone truly understands the way a body should move or not. We have added numerous animation courses such as Advanced Body Mechanics and a Pantomime Animation course so that students are able to attain that high level of animation. In other areas such as character & environmental modeling, we have added a few more track courses so that students can push their artistry to an even higher level. ACR: How integral is narrative to the process of 3D animating and to your curriculum? MT: Storytelling is huge in animation. We integrate storytelling into our curriculum carefully. Studios do not want to see work that looks like an ‘assignment’, so for every animation assignment we do we create a story for it. For example, if the assignment in our Body Mechanics Animation course is to have a character jump, then we give a reason for the character to jump, as well as an objective, a location, and a small story. Once the animation is blocked out, we check with the audience to see whether the story is clear from the main poses alone. Our seniors create either a short film or game in their final year at UIW with one semester creating the assets and the other semester animating or implementing those assets. This didn’t leave a ton of time to really flesh out the story so we created a one-hour Senior Thesis pre-production course where we spend all our time really fleshing out the story and or game. ACR: I want to talk shop briefly when it comes to hardware and software. Tell us what your students are using, Matt. MT: For our animation students, we primarily use Maya, Unity, Unreal and a little bit of Motion Builder for motion capture. By the way, when high school students ask what programs they should start playing with, we always mention Maya as it is free for educational purposes and used heavily for animation. For critiques, I’ve become fond of Syncsketch as I’m able to give visual as well as written notes on each animation. As for the character/environmental artists, their main programs are Zbrush for character sculpting mudbox, Substance Painter for texturing, Houdini for VFX, and a few others such as Marvelous Designer. The game engines we are currently using are Unity and Unreal. Our lab spaces are open to students 24/7 and our computers are top-of-the-line with dual screens. We update them every few years to keep up with hardware improvements. ACR: Do you offer insight to those students who are keen to follow in your footsteps and head to an industry hub? MT: I’m honest with my students about how competitive the industry really is out there. I tell them that if they aren’t animating every single day, there’s someone who is and they will be competing for the same job. I let them know that’s how I was able to break in; I was constantly animating and trying to improve as an animator… I still am to this day as there’s so much to learn. The bar keeps raising so we all need to keep pushing. And always be a learner. There will be times where I will give quite a bit of notes on their animation but they understand that it’s all going to help them compete down the road. Another insight I share with them is that they need to collaborate with each other and give each other feedback. They are each other’s connections- the industry is small and everyone seems to know everyone so you must be easy to work with and a team player. ACR: There are a slew of industries and applications that leverage animation and digital art outside of entertainment. Is this something you talk about with students? MT: Absolutely. We let them know that there are other applications for their skills, not solely feature films and video games. There’s so many things you can do with 3D and with the growing VR and AR technology, the possibilities on what you can do seem endless. ACR: Lastly, did you have a favorite professor in college or mentor that continues to influence you as a teacher today? MT: I’ve had a handful of mentors throughout my path in 3D. Professor Watkins, Ted Ty and Jason Ryan just to name a few. Ryan used to offer webinars every week where he would lecture/animate on a topic. I was in attendance on all of those and would always study the work he posted. The biggest things I took away were ‘work ethic’... they weren’t kidding when they said it was competitive and you have to be constantly pushing yourself. Another big takeaway was to be honest to yourself; if you know you need improvement in an area then seek help or resources to improve. There’s always room for improvement... never stop learning. ACR: Our followers know Jason Ryan and iAnimate well… a great mentor, indeed! Matt, thanks for your time today. All the best.